Beauty of Bath is a very attractive early-season English apple. It ripens at the start of August in southern England. The flesh has a good flavour for such an early variety. As with all early-season apples, the timing of picking has quite an influence on the flavour, which can go from a mildly sharp to sweeter as it ripens. Beauty of Bath apples tend to fall from the tree as soon as they are ripe. They are best picked and eaten on the same day. If you have a surplus then try juicing them, the juice will have an attractive pink tinge. The characteristic flattened shape and pretty red-flushed colouring are also found in its well-known descendant Discovery. Another common characteristic is the way the red skin will bleed into the flesh in both apples. Please fill in the details below and we will let you know when Beauty of Bath apple trees are back in stock. Beauty of Bath is one of its parents, and passes on the attractive red colouring and good disease resistance. Ireland's earliest apple, ripening in late July. 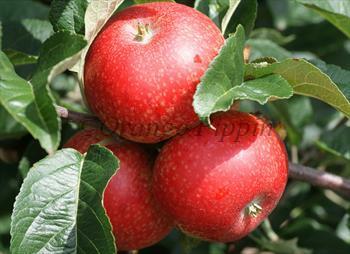 An early-season red-fleshed apple, possibly related to Beauty of Bath. Beauty of Bath is in flowering group 3. Beauty of Bath is self-sterile and needs to be pollinated by another tree of a different variety nearby. Since it flowers in the middle of the blossom season it can be pollinated by most other apple trees. Beauty of Bath is easy to grow in any part of the UK. It makes a good choice for wetter climates because it is very resistant to scab, a major disease of apples which is more prevalent in mild damp conditions. Beauty of Bath originates from Bath, Somerset. It was introduced in the 1860s and was for a time an important early-season commercial variety, although it is now mainly grown in gardens.